Row upon row, whitewashed houses in miniature are arranged like the suburbia of graveyards. The popular conception: The peculiar architectural decision to entomb the dead aboveground results from an inordinately high water table in the city. The bottom line: once upon a time when New Orleans was founded and the settlers tried to inter their dead, the coffins floated. This may or may not be true; there’s enough evidence to suggest that due to a high mortality rate, in-ground burial may not have been possible at the time of the epidemics and fires in the late 18th century. 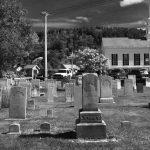 A cultural factor may also be considered in that many of the area’s settlers brought their burial traditions from France and Spain; aboveground burials were the thing to do. It is, however, quite a striking thing the first time you see it. Regardless, the solution was for the early New Orleanians to mimic their Parisian muses at Cimetière du Père-Lachaise: build the tombs above ground and allow for the heat and humidity of the south to naturally cremate the bodies, which meant they could repurpose the same tomb several times over for multiple members of the same family. Saint Louis One was founded in 1789 following a yellow fever epidemic and the great fire of New Orleans in 1788. Both these incidents packed St. Peter Street Cemetery, which subsequently closed in 1800 and now no longer exists. At the time, however, the surplus of the dead required a new cemetery to be built, and the three hundred square foot Saint Louis One was it. Why am I talking about this? I come bearing gifts, that’s why. I took a pile of pictures the last time I was in New Orleans. Regrettably, these date to 2007, but they were still instrumental in inspiriting the writing process for my short story, Second Line. When I workshopped the story, one of the primary criticisms was that I wasn’t talking enough about the burial process in New Orleans. How that would have served the story, I still don’t know: the fact that the body is lost before the story begins was always the important part, and we can still blame Hurricane Katrina for that. Today, I’m sharing those photos with you here, and if you’d like to check out Second Line, I’m linking it from the bottom of this post. The oldest and most famous of the three Roman Catholic cemeteries in New Orleans stands on the edge of the area that was once Storyville — the former red light district — on the outskirts of the famous French Quarter. Occupying three city blocks, Saint Louis One, affectionately referred to as a City of the Dead for its aboveground tombs, looks much like its descriptor: Row upon row, whitewashed houses in miniature are arranged like the suburbia of graveyards. “Saint Louis Cemetery.” Wikipedia. Wikimedia Foundation, n.d. Web. 27 Feb. 2016. <https://en.wikipedia.org/wiki/Saint_Louis_Cemetery>. “Important Research and Analysis of St. Louis Cemetery No.1 Aided by a Save America’s Treasures Grant.” American Architectural Foundation. N.p., 02 Nov. 2013. Web. 27 Feb. 2016. <http://www.archfoundation.org/2013/11/important-research-and-analysis-of-st-louis-cemetery-no-1-aided-by-a-save-americas-treasures-grant/>. “Burial Styles & Traditions – Lafayette Cemetery Research Project, New Orleans.” Burial Styles & Traditions – Lafayette Cemetery Research Project, New Orleans. N.p., n.d. Web. 27 Feb. 2016. <http://www.lafayettecemetery.org/burial-styles-traditions>. “Cities of the Dead.” Cities of the Dead. N.p., n.d. Web. 27 Feb. 2016. <http://www.experienceneworleans.com/deadcity.html>.